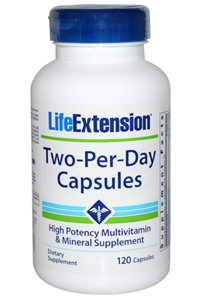 Life Extension's Two-Per-Day Formula contains nicotinamide riboside. Naturally found in milk, nicotinamide riboside has been shown in studies to support mitochondrial health and promote pathways of longevity. Two-Per-Day Capsules provide Crominex3+, a highly stable and biologically active form of chromium blended with Capros Amla and PrimaVie Shilajit. When used as part of a healthy diet, chromium plays a vital role in maintaining healthy blood sugar levels in those within normal range. Two-Per-Day Capsules also contain alpha-lipoic acid, the universal antioxidant that helps boost glutathione levels already in normal range. 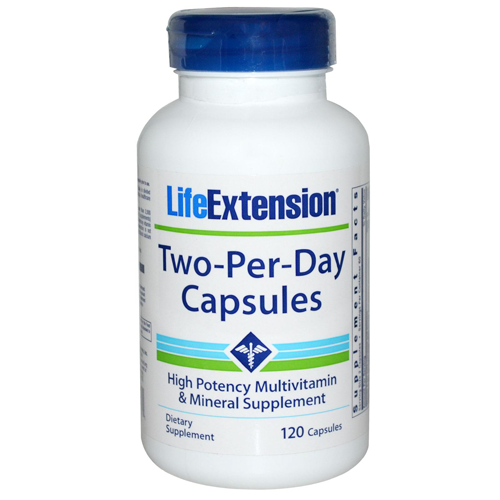 Life Extension's Two-Per-Day formula contains the form of vitamin D known as cholecalciferol (vitamin D3). It also contains bioactive forms of vitamin B2, vitamin B6 and folate, zinc citrate and natural mixed tocopherols. Vegetable cellulose (capsule), microcrystalline cellulose, rice flour, vegetable stearate, silica, maltodextrin. chlorophyllin. Contains soybeans. Caution: Individuals consuming more than 2,000 IU/day of vitamin D (from diet and supplements) should periodically obtain a serum 25-hydroxy vitamin D measurement. Vitamin D supplementation is not recommended for individuals with high blood calcium levels. Store tightly closed in a cool, dry place.